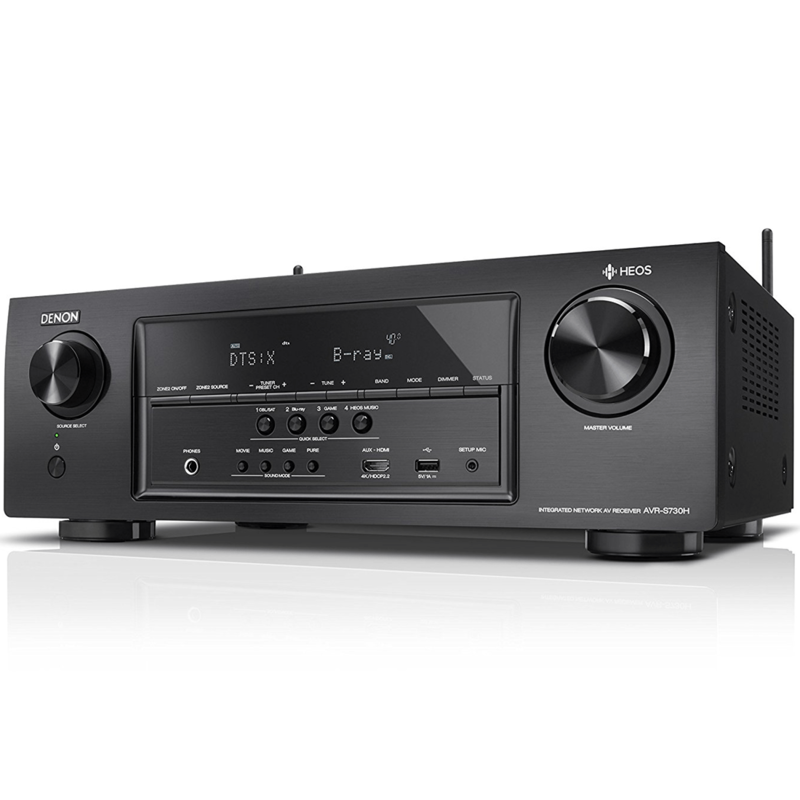 Enjoy up to 7.2-channel surround sound and wireless connectivity with your favorite speaker system and the Denon AVR-S730H 7.2-Channel Network A/V Receiver. It has Bluetooth and Apple AirPlay built-in for wirelessly connecting with your compatible smart devices. The receiver outputs up to 75W per channel at 8 Ohms and features Audyssey MultEQ sound optimization to tailor the sound to your environment. It supports Dolby Atmos and DTS:X to create a more 3-dimensional sound space. 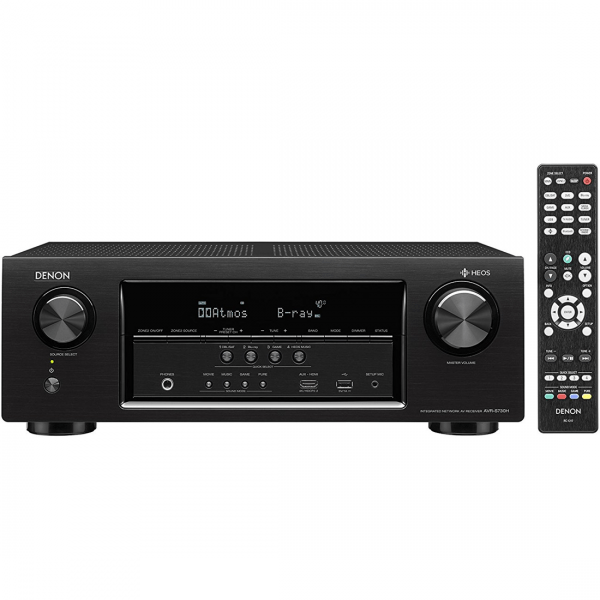 In addition to Bluetooth and AirPlay, the Denon AVR-S730H has six HDMI inputs and one output, which support 4K, HDR, 4:4:4 color, and ARC. It also has a USB port on the front for direct device connectivity. Built-in dual-band Wi-Fi will allow you to wirelessly connect to your computer or NAS for playback of your stored files. Feel every dimension in Dolby Atmos. Dolby Atmos transports you into the story with moving audio that flows all around you with breathtaking realism. Enjoy a 5.1 surround sound speaker system and 2 additional overhead speakers or 2 Dolby Atmos elevation speakers for the ultimate home theater experience – including Dolby Surround up-mixer for legacy content. DTS:X™ immersive audio places sound where it would occur naturally in space, creating a lifelike, multi-dimensional audio experience in the home. The improved immersion and heightened realism draw you into the world of your favorite movies. The included spatial remapping engine, DTS Neural:X™, gives your movie, game and music collections a new lease on life! DTS:X brings the theater home. Our HEOS technology enables the Denon AVR-S730H to become part of the HEOS wireless multi-room system, allowing you to enjoy your favorite music anywhere – and everywhere – around your home. Share music stored on your home network, Internet radio or streaming services with HEOS wireless speakers, or even other HEOS-capable receivers, throughout the house. And it’s all controlled by the free HEOS app, installed on as many smartphones and tablets as you like! The app gives you instant multi-room audio control, meaning you can command music in every room from any device: play different music from different sources in every room, group several rooms together and play the same song, perfectly synchronized, in party mode! The HEOS app puts multiple streaming services in the palm of your hand, ready to play on your AVR or any devices on your HEOS network! Enjoy music from Pandora, Spotify, TuneIn Internet radio, Amazon Prime Music, iHeart Radio, Sirius XM, Sound Cloud, Tidal, Rhapsody or Deezer *, or use the HEOS app to stream tunes or whole albums from your phone, USB stick, or computers and NAS drives on your home network. Whatever you want to hear, access it directly from the HEOS app, complete with support for favorites and playlist functions. Featuring 6 HDMI inputs, including 1 conveniently located on the front panel, the Denon AVR-S730H incorporates an advanced video section that features all you need for the ultimate home theater experience: Full 4K Ultra HD, HDCP 2.2, HDR (High Dymanic Range), BT.2020, Wide Color Gamut and 4:4:4 Pure Color sub-sampling. It is even ready for Dolby Vision and HLG (Hybrid Log Gamma; via future firmware update). Dolby Vision transforms the viewing experiences with astonishing brightness, contrast, and color. Enjoy superb audio fidelity with your favorite high resolution audio tracks. 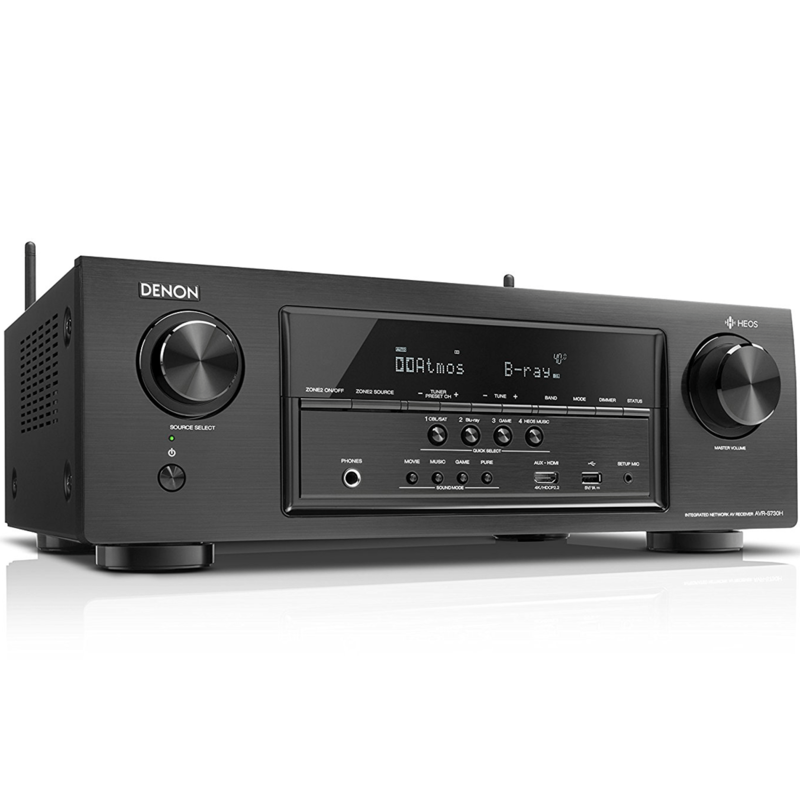 The Denon AVR-S730H features high resolution audio decoding with multiple lossless file types including ALAC, FLAC and WAV at up to 24-bit/196-kHz along with compatibility for 2.8/5.6-MHz DSD files (DSD is the audio coding format of SACD). 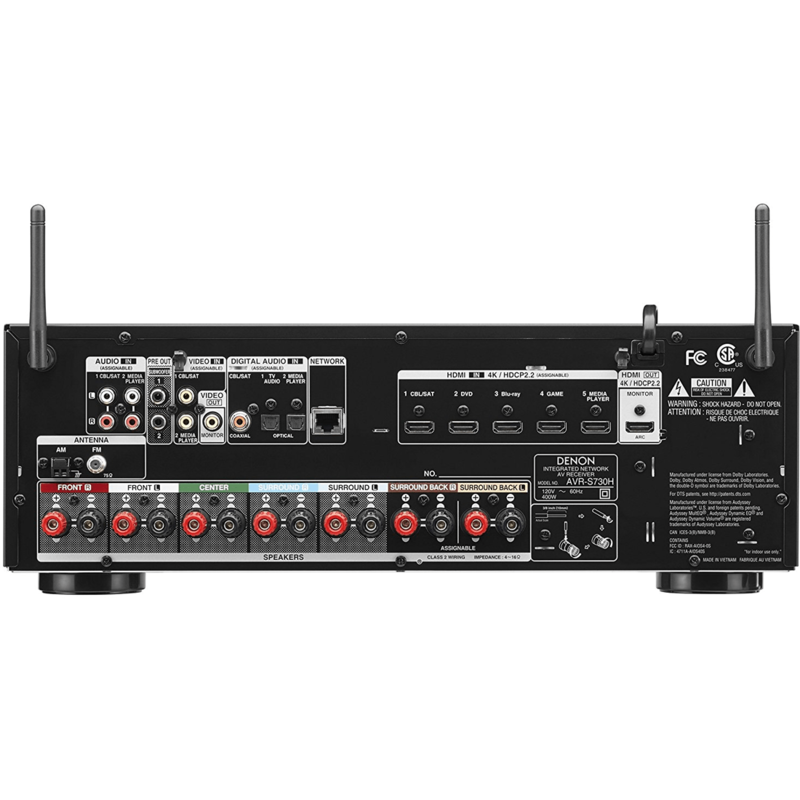 Play them from memory devices via the front panel USB, or from network sources – the AVR-S730H will also play lossy file types such as MP3 and WMA. Featuring Bluetooth and dual band Wi-Fi wireless connectivity, the AVR-S730H is equipped with an advanced dual diversity antenna RF transceiver system for robust and error-free streaming, even in congested environments. Connect to the internet through your home Wi-Fi network (or with a hard-wired connection via the RJ-45 Ethernet LAN port) and enjoy all the music options the HEOS technology offers, including thousands of internet radio stations around the world. With AirPlay you can enjoy listening to your favorite tracks wirelessly from your favorite iOS device including the iPod touch, iPhone and iPad. With the free “Denon 2016 AVR Remote” for iOS, Android and Kindle Fire, available from the Apple app store, Google Play or the Amazon app store, you can control the receiver’s operation, as well as accessing its set-up menu, from a smartphone or tablet. The app also gives you quick access to the receiver’s status display, option menus, Denon Blu-ray player control, and an online owner’s manual for your convenience. Inside the app, you can switch instantly to the HEOS App to access an incredible level of control over your music contents and streaming services, blast full HEOS wireless multi-room control. Every listening room has its own characteristics and acoustical problems. That’s why we equipped the Denon AVR-S730H with the advanced Audyssey MultEQ automatic room acoustic correction system. Via the supplied measuring microphone and mic stand, Audyssey MultEQ measures all the speakers in your home theater during setup, including the subwoofer, and then generates multiple high precision DSP room acoustic correction filters which together provide smoothest and most natural tonal balance, regardless of the brand or model of the various speakers. Audyssey Dynamic Volume smooths out annoying jumps in volume (such as TV commercials), letting you listen at lower levels and still enjoy clear dialogue, music and sound effects. Audyssey Dynamic EQ provides precision tonal tailoring for full range clarity at any listening level. 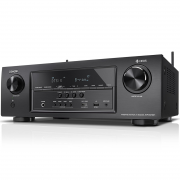 The latest Denon audio video products use Audyssey MultEQ for simple, accurate set-up and calibration of your system to the room in which it’s used. But now you can go further with the Audyssey MultEQ Editor app, going “under the hood” to view and adjust settings for detailed tuning – allowing you to customize the sound more precisely to the specific problems in your room, and tailor the sound to your personal preferences. With this comprehensive app, you can harness the power of Audyssey MultEQ to take total control of the way your home cinema sounds. For maximum ease of setup, the AVR features a horizontal row of color coded premium loudspeaker connectors, and it comes with a set of color coded speaker cable labels that help ensure correct speaker cable hookup the very first time. With our exclusive Setup Assistant along with the Quick Start Guide, you can connect and configure your home theater system quickly and easily. The Setup Assistant features clear on-screen graphics and text that quickly and easily guide you through the setup process, optimizing critical system settings for the best possible sound quality. 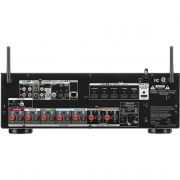 The AVR’s front panel features 4 Quick Select function buttons so you can quickly choose from the most popular sources and the system remembers your preferred audio settings for each one. The ergonomic remote control also features dedicated Quick Select buttons. And when you connect the AVR to your Smart TV you have the option of controlling the AVR via the TV’s remote control which lets you select an input, adjust the volume and choose the surround sound mode. When you connect the AVR-S730H to your Smart TV you have the option of controlling the Denon AVR-S730H via the HDTV’s remote control which lets you select an input, adjust the volume and choose the surround sound mode. You can configure the Denon AVR-S730H for a 7 channel home theater surround system or you can choose to have a 5 channel surround system in the main room with 2 of the amplifier channels dedicated to drive separate stereo speakers in another room. Enjoy a surround sound movie in the home theater room while others can enjoy stereo sound from a different source in a second room at the same time. 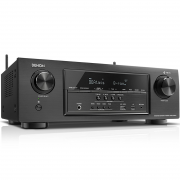 Denon Canada 1 Year Limited Warranty.